While there are some debates on whether Virtual Reality represented by Oculus Rift will become the mainstream of next generation video games long term, there are already more than 600 hundred apps/games (data updated till July 13th, 2015) developed and displayed on Oculus Rift official website share community. For newbies or originally non-VR content developers, programming or writing scripts is probably not the quickest way to get started. For new comers, using some existing game engines is highly recommended. Below are some tips for beginners who are interested in developing basic Oculus Rift apps. First of all, explore some cool ideas that you want to carry forward to make it into a game. For example, try to watch some favorite movies or read some books and search for something you’d love to experience in VR. Other than the programming language you want to work with when choosing a game engine, there are some other elements we can consider. Unity: $75 per month for 12 month license or $1500 for one-time fee. It has been featured by Oculus as first-party VR support. As of July 6, 2015, it has been updated to the version 5.1.1ps, which provides support for virtual reality development with both Oculus Rift and Samsung Gear VR. More details in terms of version update can be referred to Oculus official website developer history. Advantage: premiere in creating mobile games and 2D games while the engine also supports integration of any 3D applications. The interface is generally regard as more intuitive and easier to grasp. Unreal Development Kit (UDK) /Unreal Engine 4 (UE4) : $19 per month, but you have to pay 5% of gross revenue after the initial $3,000 benefit per product, per quarter built by using UE4. Recently, an exciting news is that UE4 has announced free of charge for colleges and universities with accredited video game development programs though the 5% policy still applies. Advantage: supreme in creating 3D games and excellent graphical capabilities allowing you to creating basically any styles you want. CryEngine: Oculus Rift now support CryEngine 3.8.1 and beyond. Like the other two engines, it allows developers of non-VR content to create content with little to no VR-specific code. Other than oculus rift, it also supports other head-mounted display, like Carl Zeiss Cinemizer OLED VR Glasses. Here is an article with easy steps to guide you through setting up VR with CryeEngines and get started. Any of the engines can get the work done, but depending on what you are creating, one engine might feature more in your work than another. For more comparisons of game engines, please refer here. 2, 3D editor (to built all 3D objects): Blender, 3D studio max, Autodesk Maya. 3, Image/Texture editor (to build all texture on objects): Photoshop, Gimp, Paint.net(windows), Pixelmator(osx). 4, Sound editor (to add sounds and music effects which can be converted to game engines): audacity, wavepad , Adobe audition. After you have picked the game’s engine and other tools you want to use to develop the game it is always good to watch some demos or online tutorials to get your feet wet. There are tons of free online tutorials informative enough to teach yourself. Step 2 and step 3 are interchangeable, as sometimes you may want to watch some tutorials ahead of time to get some ideas about which tools are favorable to you. 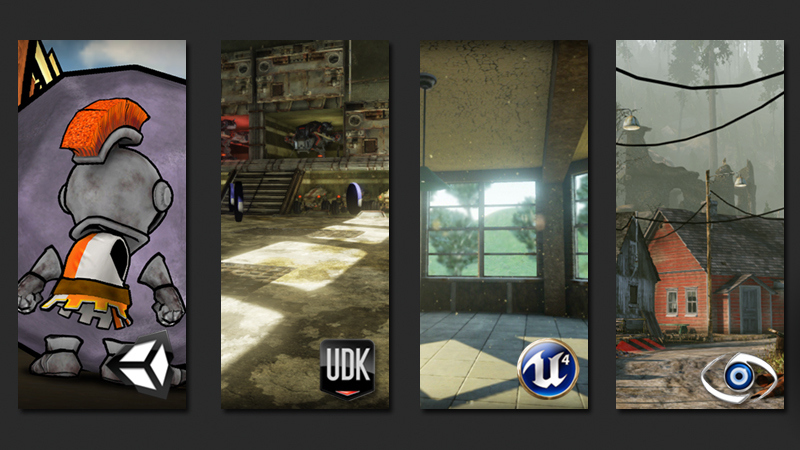 UDK Tutorial list : UDK video/text tutorials covering the entire process from basics, to 3D modeling, texturing, material creation, kismet and gameplay integration of your game environment or level design. UE4 Tutorial list : Epic offers about 200 professionally-made tutorials on Youtube. They are organized into playlists by topic, so that you can easily retrieve the topic you want to learn. Unity: it provides a set of step-based tutorials covering up various projects and topics, including learning the engines; a good thing about it is: for each project, it is marked with difficult levels e.g. beginner, intermediate, advanced, so that it can be easier for you to make judgement and pick the project applicable to your level. Blender: This tutorial series is aimed at the absolute beginner and takes you through everything from downloading and installing to modeling to lighting to render. Unreal Engine4 Tutorial: Baby’s first VR app: (Very easy hands-on demo for starters from the very beginning, including how to download and set up the game engine software). Amazingly, you can not just DIY the VR content but also the VR goggle headsets. Unlike many other VR companies trying to advance their headset to an exclusive premium level, tech giant Google has gone to a total open source route to allow people to contribute creatively by enjoying virtual reality without involving much expense. They came up with “I/O Cardboard” – a cut-and-fold VR headset that integrates with almost any types of phones, including both Android and iPhone devices with only three steps. Cardboard is an open-source project that leaves the development field wide open for whoever thinks they can improve on what Google has started. 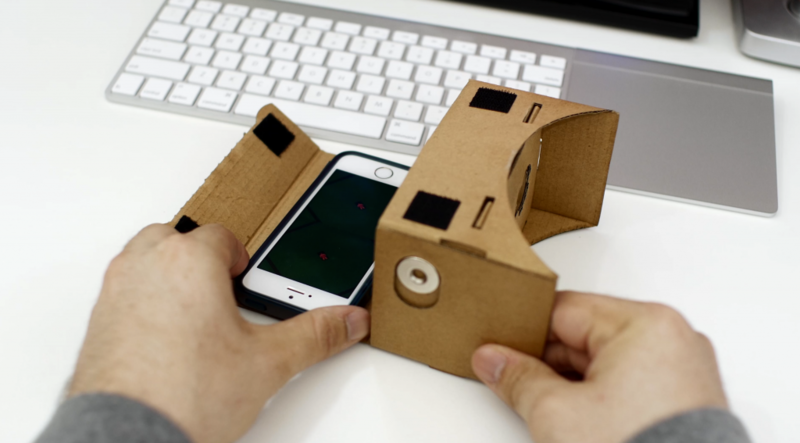 The full design specs to create a Cardboard prototype are available through Google for free. In this emerging VR world you can be a player as well as a developer, and it is all up to you. Hi Ping, I’m on the side of the debates betting against Virtual Reality represented by Oculus Rift will becoming the mainstream of next generation mainly because of cost and content. I know there are lots of games but I think what will make it mainstream is video content in virtual reality.